Mega Love For Mega Man? There's A Helmet For You | OhGizmo! By David Ponce on 07/13/15 • Leave a comment! I remember Mega Man fondly. However, I don’t think it’s the kind of fondness that would have me dropping $150 for a plastic replica helmet, no sir. But you know, we totally don’t judge and realize that there are those among you who might just go a little bananas seeing this officially licensed prop. 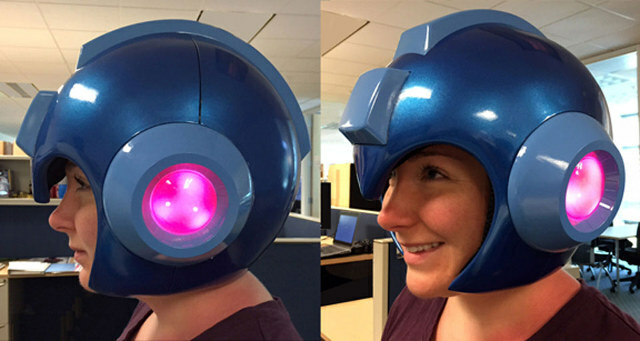 There’s been attempts at creating a wearable Mega Man helmet over the years, but its never been made officially. Everyone’s been clamoring for one – and now you really can be Mega Man with this full-size, wearable Mega Man helmet made of high quality ABS plastic with a high polish finish, authentic proportions and details, plus working LED lights! A unique clamshell hinge allows the front and back half of the helmet to easily open up to comfortably fit your head inside the soft padded interior for a perfect fit. This is a high quality replica of the Blue Bomber’s helmet – perfect for display in home or office, but it also doubles as the ultimate role play accessory! Comes shipped in a decorated box suitable for displaying your helmet when not in use. Extremely limited quantities will be produced based on advance pre-orders. Order NOW! Pre-Orders will only be open for a limited time. So there you have it: the best, most official way to proclaim your love for all things Mega Man.